Last weekend I took part in synchronized baking again. This is always fun and the ladies chose another great recipe: potato flatbread! Those of you who are already reading my blog for a while might have noticed that I have a predilection for spelt 😉 So, I decided to swap the wheat for spelt, reduce the amount of water and take some more yeast than in the original recipe. The result was absolutely amazing and so delicious. I’m definitely going to make this again for a nice barbecue with friends. First you have to boil the potatoes. Then you peel and mash them. Next, you add the mashed potatoes, flour and salt to a big bowl. Dissolve the yeast in lukewarm water and pour the solution in the bowl as well. Now work everything with the dough hook until a smooth dough forms. Therefor knead it for five minutes on speed 1 and for another eight minutes on speed 2. Cover the bowl with some beeswax cloth wrap and let it sit in the fridge for 20 to 24 hours. The next day you take the dough out of the fridge, cut it in half and shape two oval loafs. Put the dough pieces in a clean tea towel and let them rise for one hour at room temperature. After that you put the dough pieces on the floured countertop, drizzle some olive oil on top and then gently press it into a hilly flatbread by just using your finger tips. Now you preheat the oven, a bowl for steaming and a pizza stone to 280°C, while the flatbreads are resting for 30 minutes. After that time you press down the flatbreads again to make them a bit longer and wider. Remember to only use your finger tips while doing that. Then you sprinkle some smoked salt on one of them and some fresh thyme on the other one. Bake them separately for approximately 10 minutes with a bit of steam and let them cool on a rack. By the way, I used a wooden cutting board to transfer the flatbreads from the countertop to the oven. 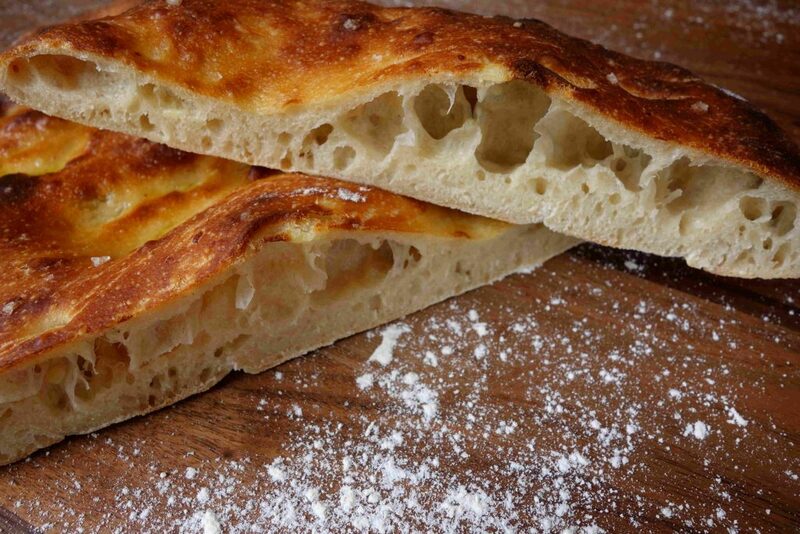 The potato flatbread tastes best when it is still warm, but it lasts up for a few days.